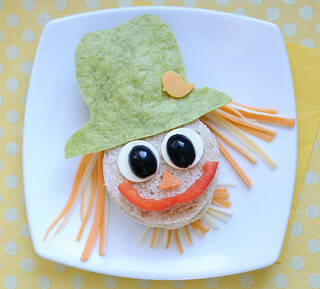 Jill Dubien's latest cute lunch idea: A silly scarecrow sandwich, perfect for the fall months. 1. Take 2 slices of whole wheat bread and using your knife (or the open end of a drinking glass), cut the 2 slices into circles. 2. Place some lunch meat of your choice in between your 2 bread circles and place the sandwich on a plate. 3. Using your knife, cut your spinach tortilla into a hat shape, and place this hat on the top of your circle sandwich. 4. Slice your red pepper into a smile and place this smile on your scarecrow. 5. Slice your carrot into a small triangle and place this on your scarecrow for a nose. 6. Cut your slice of mozza cheese into 2 circles. I used a small circle cookie cutter, but you can use a knife too. Place these 2 circles on your sandwich for the eyes. 7. Pull your string cheese apart into thin strings. Place these thin strings underneath the scarecrow’s hat and also underneath the face. Use the entire cheese. 8. I used a small birdie cookie cutter and cut a little birdie shape out of a slice of cheddar cheese. You could try this with a knife, too. I placed the birdie on the scarecrow’s hat. 9. Finally, slice a black olive in half and place the 2 halves on the 2 eyes. Isn’t he just adorable?! I’m not sure he’ll scare anything away. He definitely didn’t scare my kids away from gobbling this lunch right up. Enjoy!